Everybody’s favorite free outdoor yoga lessons return to the park in May. Presented in partnership with lululemon athletica, Bryant Park Yoga is an excellent mind-body workout for students of all ages and levels. Classes are taught twice a week by a variety of talented instructors. Tuesday morning sessions take place on the Upper Terrace, directly behind the New York Public Library and Thursday evening sessions are on the lawn. Yoga mats are provided free of charge, but you are welcome to bring your own. 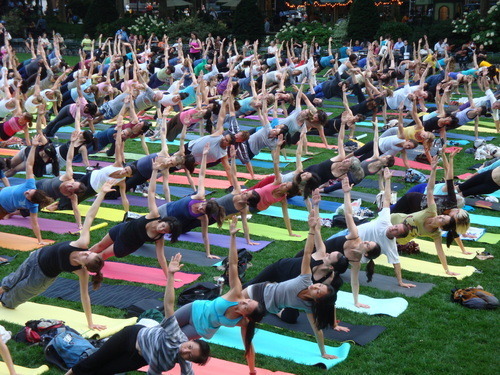 There is no limit on the number of students who can participant in each class, but Bryant Park Yoga has become so popular that you may want to show up early to claim your spot. Our record setting class took place last summer on Thursday, August 6 with 308 participants practicing side by side. Help us set a new record this year!